world’s first cities, the Upper East Side along Lexington Avenue became one of the city’s first postwar neighborhoods. Most of those early rowhouses remain today, wearing the changes of time, in one of the city’s still premier neighborhoods. Insurance maps of the area illustrate these changes. These interesting and useful documents were published to identify the characteristics of buildings for insurance purposes. Colors and other codes tell us about a building’s materials, size, and use. 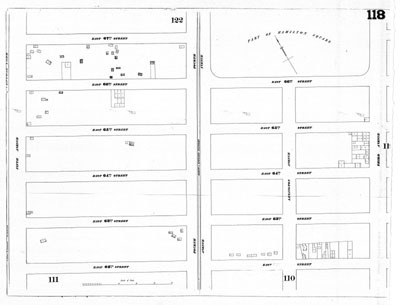 The Perris map of 1862, for example, shows us an Upper East Side with little but a few wooden buildings scattered about, often not aligning with the street grid. An occasional Florist Garden and a baseball field are seen, and there’s a brewery on East 61st Street. Lexington Avenue dead-ends at Hamilton Square, a large park that extends between 66th and 69th Streets. 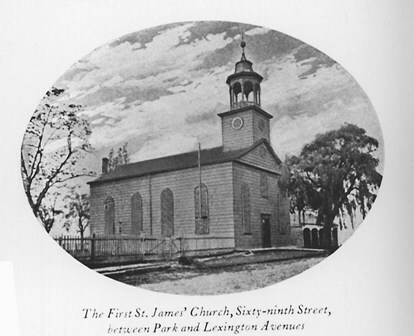 The first St. James Church sits on the northern edge of the Square, looking like a little country church. In the Perris and Browne map of 1871 the cityscape changed. Scattered wooden buildings remain, but numerous rows of townhouses have sprung up on the side streets and on Lexington, along with small manufacturing buildings and increasingly large institutions. Hamilton Square is gone, with the Seventh Regiment Armory and a variety of educational and benevolent institutions take its place. Today, Hunter College occupies much of the land that was once Hamilton Square. Who were the developers that built these first residential rows, and who purchased and lived in them? A look at the south side of East 65th Street between Lexington and Third gives us a snapshot of these New Yorkers. The developers were typical of the many small speculators throughout the city who ventured into new neighborhoods and created much of the cityscape we value today. This row, 132 to 146 East 65th Street, was developed by J & G Ruddell, using the architect F.S. Burns. Each house was twenty feet wide, and three stories high on a basement, with a classic brownstone façade. Because the row was completed in 1871, the first Federal Census that we can look at to see who lived there is from 1880. These handwritten documents are the tally sheets that census takers carried from building to building as they enumerated the occupants. 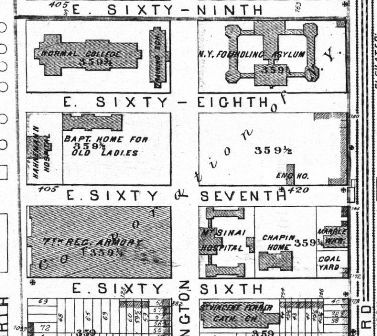 On 65th Street, the heads of the households were William McClag, Louis Timm, Clarence Edwards, Thomas Whitacker, Benedict Hirsch, Charles Sterm, Benedict Heimann, and Isaac Methyer. Mr. McClag and Mr. Timm were born in the United States, Mr. Edwards in England, and the others in Germany. All of the households had at least one servant (all women), five included extended family members, and one took in six boarders. None of the women in the households worked outside the home; the men included a civil engineer, a publisher, a collar manufacturer, several in the wine or liquor business, a lawyer, and physician, and an architect. The boarders included two “clerks”, a clergyman, an “agent for steamers”, and one man in “hardware”. 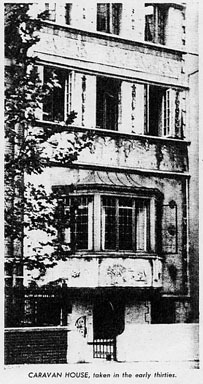 In just a few years the new neighborhood was filled with houses and their new owners, many of them German immigrants like the families on East 65th Street, at a time when the German population of New York City was climbing to over 25%. Transportation uptown and downtown was convenient for the area, with streetcars running on Third and Second Avenues, to be replaced by elevated trains in 1878 and 1880. Blocks to the west of Lexington filled more slowly. Affluent New Yorkers were uncertain about how desirable it might be to live right next to the still maturing Central Park, and the open railroad trench on Fourth (now Park) Avenue was most unpleasant. showing surface car track removal project. October 23, 1936. W.P.A. photo federal art project. 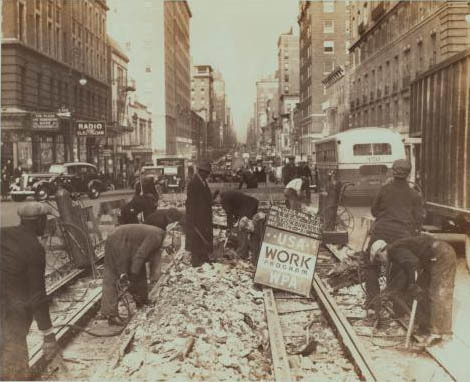 But progress was coming to Lexington Avenue, with plans for a subway. The first subway had opened in 1904 on the West Side, with the next lines going to the Bronx, Brooklyn, and Queens. 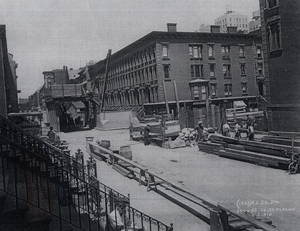 Ground was broken on the Lexington line in 1911, and the avenue was transformed. Stoops were removed and commercial space inserted into the ground floors of brownstones, or into new fronts that provided even more room, often on two stories. The pattern we still see today was set of shops with apartments above on the avenues and residences on the sidestreets. Soon changes were coming to these homes as well, as new owners wanted to “update” the fronts of their buildings in new styles. Back on East 65th Street, each of the houses we looked at before were altered in different styles that largely remain and still enliven the street with their variety and charm. A new housing type also arrived, as apartment buildings became fashionable, and economical given rising land values. Today the mix of building types and styles on Lexington Avenue and the side streets reflect this rich history. We invite you to learn more about this neighborhood on this website, celebrating the expanded districts listing on the National Register of Historic Places.